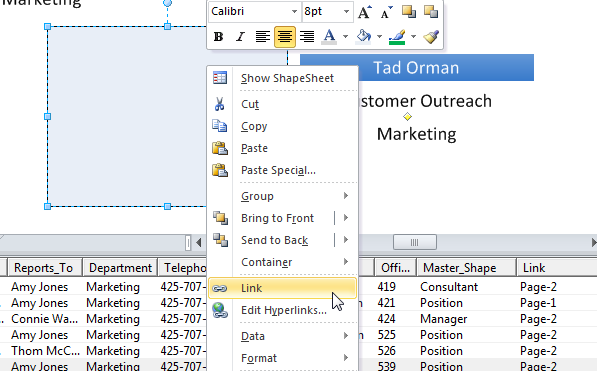 I demonstrated how to import hyperlinks into Visio shapes in a previous post – see https://blog.bvisual.net/2007/11/15/importing-hyperlinks-into-visio-shapes/, however, one of my readers wanted to know if the same mechanism can be used to create an hyperlink to another page in the same Visio document, rather than to an external web page. Well, it can be done … with a little preparation. In my example, I have put the values Page-1 or Page-2 in the Link column, and set this Data Type as String Hyperlink, and this sets an Hyperlink with an Address Page-1 or Page-2. However, other pages, and shapes, are entered into the Sub-address property, but Visio prevents you from setting this if there is anything in the Address property. So, the challenge is push the Address values into the Sub-address automatically. Fortunately, the name of the Hyperlink row is predictable because it is named according to the Label of the Shape Data row, with a prefix _VisDM_. Therefore, the Link Shape Data row will create an Hyperlink row named Hyperlink._VisDM_Link. Knowing this, you can prepare a Master shape to be linked to the data with some ShapeSheet formulas. The first action is to create the named Hyperlink row in the master shape. Then I created two User-defined cells with some ShapeSheet formulas in them. These two User-defined cell formulas will ensure that the data-linked shape will get an hyperlink to another page in the document (provided that you have entered a valid page name!). You should be aware that the hyperlinks will not get automatically updated if you change the names of the pages. You should go back to your data source and update the values there before refreshing the shapes from it. This worked beautifully – for some reasone the double click code isn’t working though. I think that WordPress has displayed incompatible double-quotes … try replacing all of the double-quotes with the one in Visio. I was able to get the code to take, however, I double click and nothing happens. Am I supposed to put this same formula in the EventDblClick tab? if not, what am I supposed to put in that tab? I am attempting this in Visio Pro 2013, but get “Error in formula.” when attempting to save either the LinkTrigger orLinkInvisibleTrigger formulas. An alternative, working for me in Visio Pro 2013, is to specify the page link as “MyDiagram#MyPage” along with setting the Data Type as String Hyperlink. That value goes into the Address field, and there is no need to move it to Sub-address.